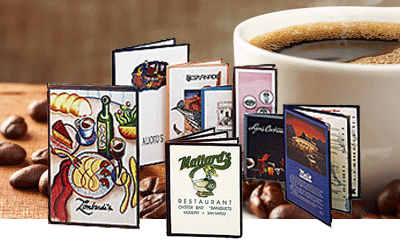 Our Classic Café menu covers are one of the most durable Café Menu Covers available. We use high quality raw materials in the production process. Trims are welt sewn with a Double Turned Edge for the finest presentation. With a variety of Metal Corners and Crystal Clear or Matte Finish Plastic you can create your custom Café Menu! Trims are welt sewn and the high quality plastic means a longer life, hence lower overall cost. Our Café menus are available in many standard sizes and layouts. We offer Custom Size Café Menus as well as side loading options for single panels. Custom is easy with World Wide Menu, just give us a call or email your request. Café samples are sent out at no charge.